Well, we’ve now made it through two American Holidays in Ukraine! After teaching our students all about Halloween, we took 3 weeks off due to a national H1N1 quarantine, only to come back to school just in time for Thanksgiving! Last week’s English classes and clubs included vocabulary words such as: turkey, pilgrim, Native American, pumpkin pie, cranberry sauce, and mashed potatoes. I think it’s really interesting for Ukrainian students to learn more about holidays they don’t normally celebrate. They certainly pay much better attention in class than when we’re reading about “the invention of the telegraph” from their textbooks. (Boooooring!!) This Tuesday was World AIDS Day, providing us with plenty of classroom material for the week; Christmas and New Years will take over the next week or two of classes. I don’t know what we will do come January, with no interesting events or holidays to discuss! 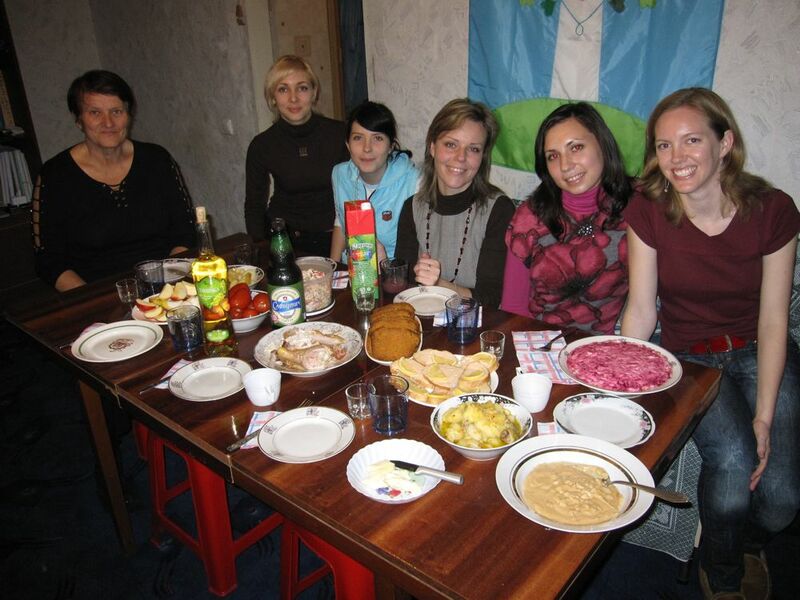 Valentina, Tanya, Vika, Olya, and Luda joined us for their first Thanksgiving dinner! Anyway, we were fortunate to celebrate two Thanksgivings last week, although neither fell on Thanksgiving Day. On Wednesday, we had a very nice dinner with most of our English teachers. They really wanted us to feel welcome and at home here in Ukraine during our “national holiday.” In lieu of turkey, Alex cooked a chicken, and instead of pumpkin pie, we made pumpkin bread with a pumpkin Luda brought us. Olya’s son made stewed potatoes for her to bring. Luda brought a salad-type dish called шуба (“shooba”) that involves layers of fish and shredded cabbage, carrots, and beats, all held together with mayonnaise (colored purple from the beats). It’s actually delicious, which means a lot coming from me. Tanya brought a potato/pea/carrot salad (again – more mayo), and Vika provided some juice. Valentina made some delicious homemade grape juice along with a jar of preserved, possibly pickled tomatoes. It was quite a feast! Friday, we headed over to Frank and Carol’s apartment in the nearest city for another celebration. About 15 PCVs showed up for a weekend of relaxing, football-watching, football-playing, bargain hunting in the thrift stores, sweating in the sauna, game-playing, and eating, of course!! Again, chicken was our main dish, along with stuffing, pumpkin pie, mashed potatoes, cranberry sauce straight from the can, pumpkin casserole topped with mini marshmallows (substituted for the lacking sweet potatoes), pasta salad, and more! 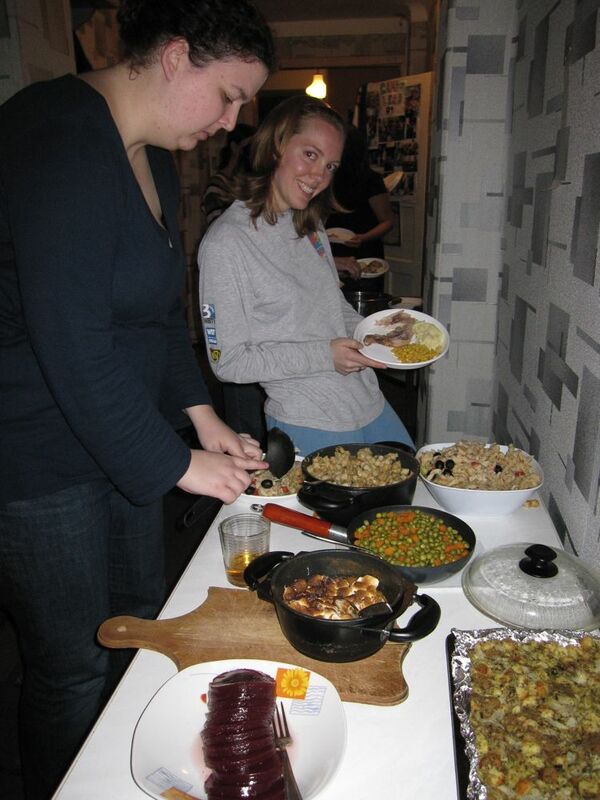 We definitely had plenty to eat and a really nice weekend with the other volunteers. 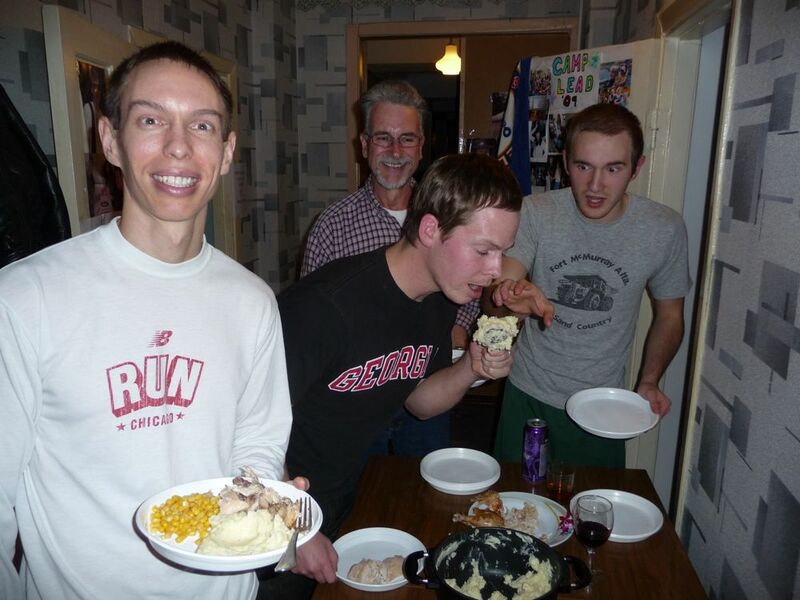 Alex, Carl, Ben, and David dig into the Thanksgiving feast! Caitlin and I fill up our American-sized plates! Many thanks to Anna and my fabulous folks for sending some great Thanksgiving staples! Alexis and Carol show off delicious apple and pumpkin pies!